Zhengzhou Huabang Machinery Manufacturing Co.,Ltd. Impact crusher can deal with any large, middle, and small materials(granite, limestone, concrete, etc.) with length no longer than 500mm, and compressive strength less than 350Mpa. It is widely used in mining, highway, railway, and construction industries to produce artificial sandstone materials. At present, the comprehensive capacity of impact crusher is prior to Cone Crusher and Hammer Crusher. 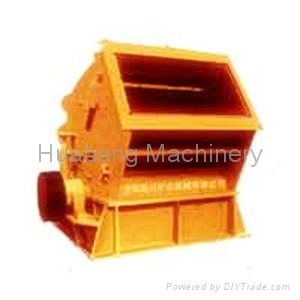 Impact crusher is a kind of crushing equipment which uses impact energy to crush maters. When getting into the effective area of hammer plates, due to the high speed of striking, the raw materials are thrown onto the impact equipment which is installed above the rotor. Then the materials are rebounded to the effective area of hammer plates and crushed again in the crushing chamber. At last, when the particles reach to the proper size, they will be discharged from the bottom of the machine. Impact crusher has the characteristics of novel structure, no-bond connecting, high chrome plate hammer, special impact lining plate and energy saving. The finished product is in cubical shape and the discharge granularities can be adjusted. It simplifies the crushing process. They have the advantage of greater reduction ratio and the final materials are in cubical shape and even.